Transform your organization into a dynamic catalyst for success. Accelerating Performance is not just another "warm and fuzzy" change management book - it's a practical, comprehensive, data-driven action plan for picking up the pace and achieving more. Cowritten by one of the authors of Beyond Performance, this audiobook draws on a combination of empirical research and decades of experience advising global companies to show you how to reduce time to value by building and changing momentum more quickly than your competitors. A single taste of success is all it takes to spark change, but the hard work of following through requires constant vigilance - and a plan. Learn how to capture that drive, bottle it, and use it to sustain motivation, inspiration, and achievement. Deliver at the highest level, and then turn around and do even better next time. 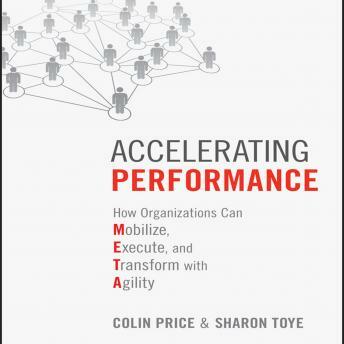 Accelerating Performance gives leaders a step-by-step framework for taking action and transforming their organizations, teams, and even themselves - starting today.